Dana Hoshide and I returned to Watsonville to interview 4 people the week before Thanksgiving. We left cold and drizzly Seattle and traveled to foggy mornings/sunny afternoons Watsonville to interview Sho Kobara, Fred Oda, Eiko Nishihara, and Yoshiko Nishihara. Sho Kobara grew up in Watsonville and Salinas before the war. During the war he was incarcerated at Poston and served with the U.S. Army in Japan during the occupation. Fred Oda's father owned a barbershop in Watsonville before the war. After the war, Fred joined his father in running the barbershop. 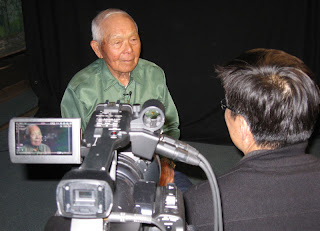 Fred's spent a lot of time in his interview describing the prewar Japanese businesses in Watsonville. Eiko and Yoshiko Nishihara are sisters (maiden name Hirahara) who ended up m arrying a couple of Nishihara brothers. 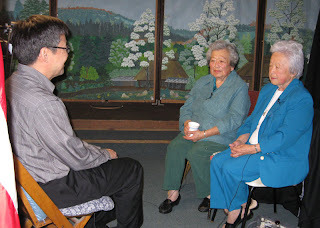 Eiko and Yoshiko grew up in a large family (13 children) in a large house in Watsonville. The house (Redman-Hirahara House) is currently being preserved for possible renovation as a prime example of a Western Victorian farm estate.